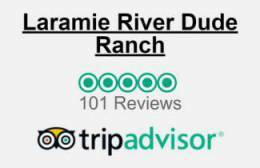 Laramie River Dude Ranch - Meals & Lodging. All your meals, snacks, lodging, and activities are included in the rate you pay. You can leave your purses and wallets in your room. 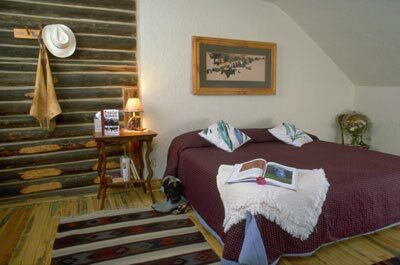 For accommodations, choose from a room in our lodge or one of our historic log cabins. There is no difference in price. 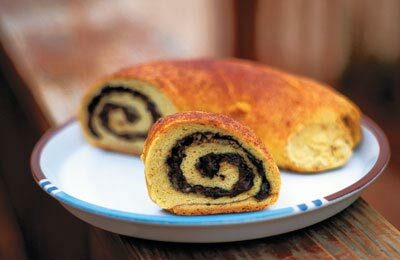 Outdoor activities and fresh mountain air encourage healthy appetites. 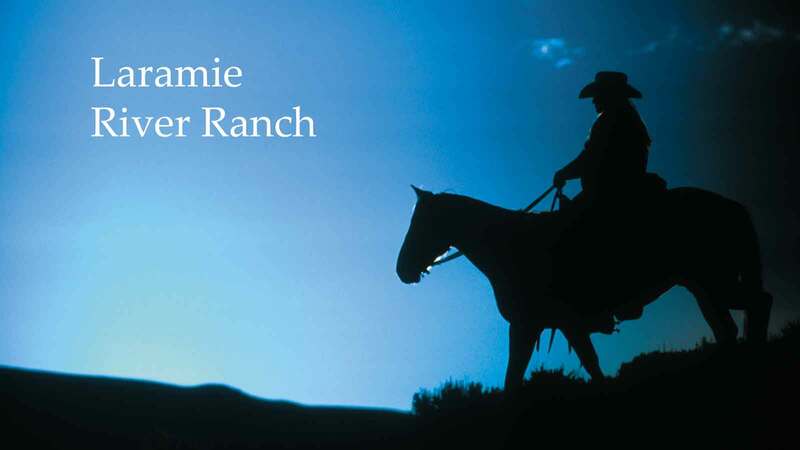 Whether it's on the trail or at the ranch, meals are an event at the Laramie River Dude Ranch. 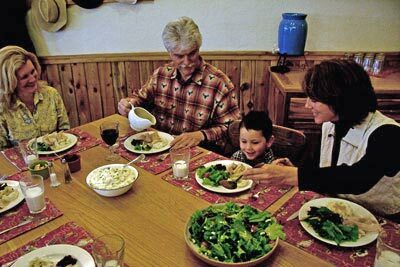 In keeping with informal, western tradition, meals are served family style. The whole LRR team was so friendly that we really felt like being at home. Your food is amazing!!! Martin says that he will have a hard time to get down to his former weight. Our kitchen prepares delicious entrees, fresh salads, ranch baked breads, fruits and vegetables, and desserts which keep you coming back for more. We're happy to accommodate special diets with advance notice and vegetarian alternatives are available at every meal. 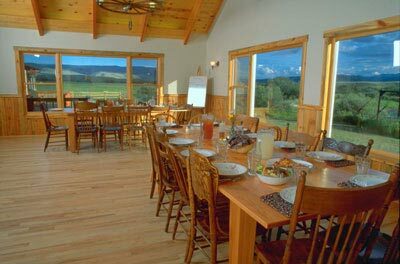 The dining room offers views of snow-capped Rawah peaks and the Laramie river. Large tables provide ample room for larger families. The crew eats with our guests so you'll find yourself surrounded by new friends. I have to say that although the riding was fantastic, the scenery stunning, and the company the best, we will long be recounting the different and totally delicious desserts we had each meal! 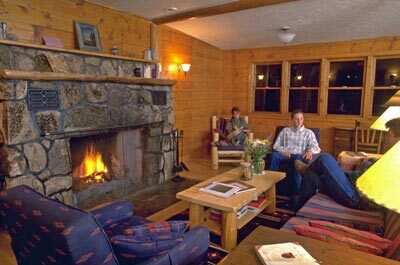 The lodge was built in the late 1880's with a spacious living room, beautiful stone fireplace and a dining room which overlooks the Rawah peaks. 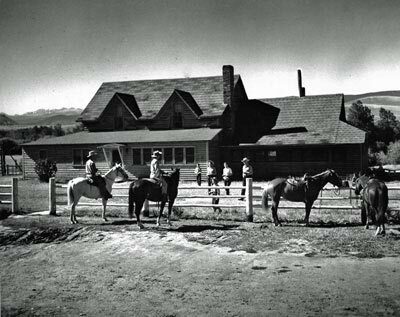 The UT Bar Ranch hosted guests from across the country and around the world from 1937 to 1971. Our lodge maintains the charm of the original structure while providing guests with the modern comforts including private bathrooms, climate controls in each room, and handicapped accessibility. The living room is a favorite place for playing cards, reading, and relaxing by the fireplace. There are ample public spaces for guests to mingle with each other and with our staff. Lodge rooms offer more community than a private cabin. Read by the fire when everyone else has gone off to bed or come down to the kitchen for an early cup of tea. Each room has a unique character - some are small and cozy while others are larger and can accommodate whole families. Daily maid service leaves you more time to get out and enjoy yourself. Five historic log cabins provide an alternative to our lodge. 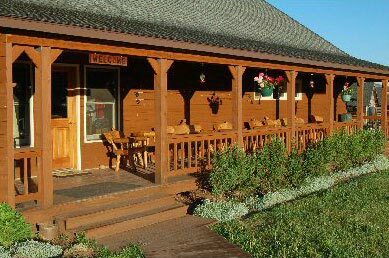 One and two bedroom units are located along the river and LaGarde Creek just across the walking-bridge from the lodge. 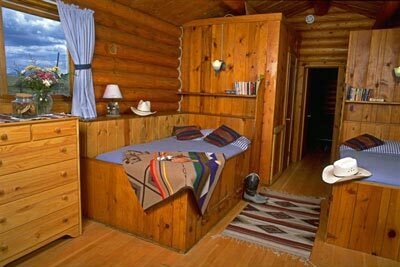 Originally constructed of materials cut from local forests, these cabins are authentic and comfortable. 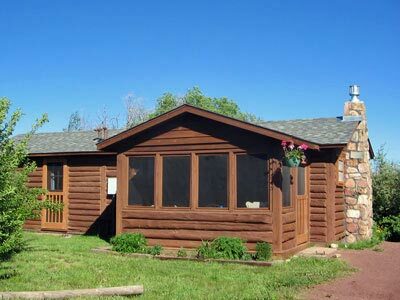 LRR's log cabins provide similar amenities to those found in the lodge. Fresh flowers and your own personal cookie jar are freshened daily when your room is cleaned. Each cabin has a comfortable screened-in porch in which to relax or entertain friends. One-bedroom units have one built-in queen and one built-in twin bed. They are quite comfortable for couple and families with just one child. Our two-bedroom units have one room with two built-in twins and a second room with a king bed. With advance notice we can reconfigure the second room to have two twin beds as well. Thanks for the ride of a lifetime. Your operation is an exceptional statement of excellence from the stable to the kitchen, right down to the cabins. Thanks for helping us to 'stop and smell the sage'.